A quick Google of the top five orchestras in the world and their sponsors reveals that with the exception of the Vienna Philharmonic, all rely on patronage: The Royal Goncertgebouw – ING group and Unilever; Berlin Philharmonic – Deutsche Bank; London Philharmonic – Arts Council England; Chicago Symphony – Bank of America. Fortunately, we are blessed with our own industrious patrons of the arts in Cape Town, who understand the value in supporting the continuation of many art forms, and many talented artists in our city. 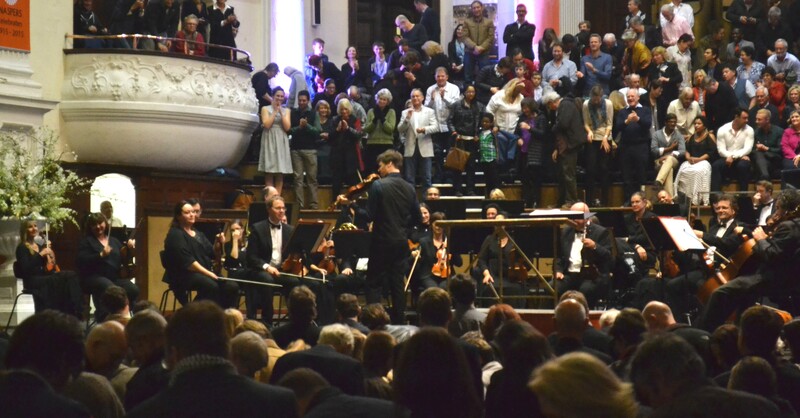 Naspers, a Cape Town based 101 year-old media group that includes OLX and Media24, is a principle supporter of the Cape Town Philharmonic Orchestra, and it is thanks to their tenacious patronage that we were able to appreciate this once-in-a-life-time spectacle in our City Hall over two nights last week. After the speeches, I hope I was not the only one with an irrational expectation for Joshua Bell’s entrance, only to remind myself that he was only coming out after the interval! But such was the electric atmosphere in that hall, and the suspense extended into Leonore 3, Beethoven’s largo tempo seeming to tease us, accentuating the anticipation. Gueller rode the tension like a wave, keeping his customary pace and when the theme burst it was well articulated by synchronous strings. This work features the invention of the offstage trumpet – what an ingenuous idea! I’v always wondered though – does he still have to wear a tux? The orchestra matched up to its usual high quality with good clean entries by horns and impressive virtuosity. Beethoven wrote very little that was not virtuosic even for his orchestras, and Gueller’s exciting tempo made this work a delicious aperitif for what was to come. The orchestra’s virtuosity continued with the “Italian”, beginning with a correctly delightful pounce, and continuing the confidence-inspiring tempo that maintained anticipation and built to a thrilling coda, just as Rodney Trudgeon promised in his program notes. When Bell began to play, it became overwhelmingly evident with each passing bar that the sound I was hearing was unlike any sound I have ever heard before. Somewhere between Perlman and my imagination of how the Tchaikovsky should sound, my animation was suspended. Such incredible soft alluring tones and runs that were miraculously clear even over the full orchestra – such a sound! At the time I was incapable of comprehension and it was some time before my mind could understand that over 300 years, Bell’s uniquely crafted 1713 Gibson Stradivarius violin has compressed under the tension of the strings (so one theory goes) to produce a quality of tone and volume that no violin craftsman has since been able to match. Hearing a legendary work of art performing in the hands of an extremely gifted and expressive interpreter, I am now convinced that Joshua Bell is magic, and his violin is a wizard. His cadenza made time stand still, and yet it seemed to be over so soon – How many days were we glued to our seats in the City Hall, hypnotised? Occasionally I came to, and noticed his eye contact with the winds or brass, and that although he is an extremely charismatic and emotive player, Bell had a way of staying in touch with Gueller and the orchestra. Usually this is more noticeable in chamber groups and I always appreciate how Camerata Tinta Barocca stays connected with eye contact. I find this essential for any group of musicians to stay in time, even when they are playing with a conductor and a score. When this happens, the music becomes enchanting, and the orchestra becomes the immaculate cloud on which the soloist floats, taking the audience with him. Technically, the concerto was one of the top performances of all time. Many virtuoso composers include sections that play with a little 4 note pattern like a finger exercise, where the orchestra waits for the soloist to reach the fingers’ limit of acceleration. In moments like this, few performers these days can surprise their audience, elicit gasps of amazement, and earn themselves the title of “virtuoso” – Bell is one such performer, and he does so with velvet sensitivity. His encore was the Yankee Doodle variations by Henri Vieuxtemps. I enjoyed the reference to America, and only later discovered that Bell is in fact descended from Vieuxtemps’ teaching lineage: Vieuxtemps taught Eugène Ysaÿe, who taught Josef Gingold, who taught Bell. The piece is well beyond the realm of normal violin technique, in fact Robert Schumann, a friend of Vieuxtemps, compared him to Niccolò Paganini. Well, patrons of the arts, Naspers set a pretty high bar! Who’s next? Full size photos on Pinterest, plus 12 more! 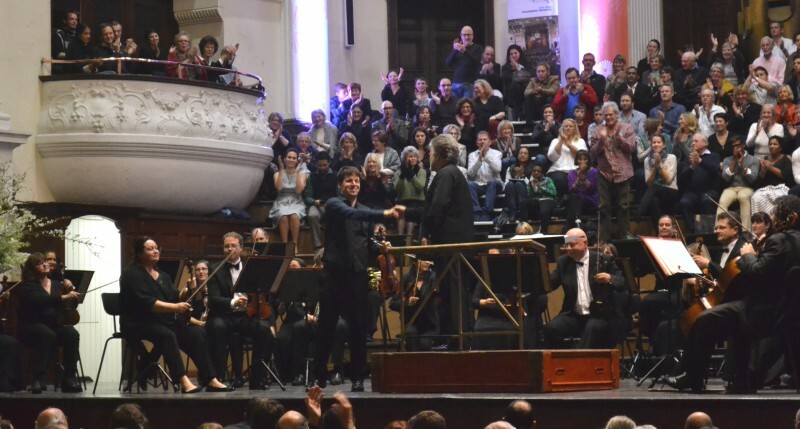 This entry was posted in Classical Music Review, Concert Review and tagged #AndyWilding, #ClassicalReview, #ConcertReview, Bernhard Gueller, cape town philharmonic orchestra, CPO, CTPO, Joshua Bell Cape Town. Bookmark the permalink.